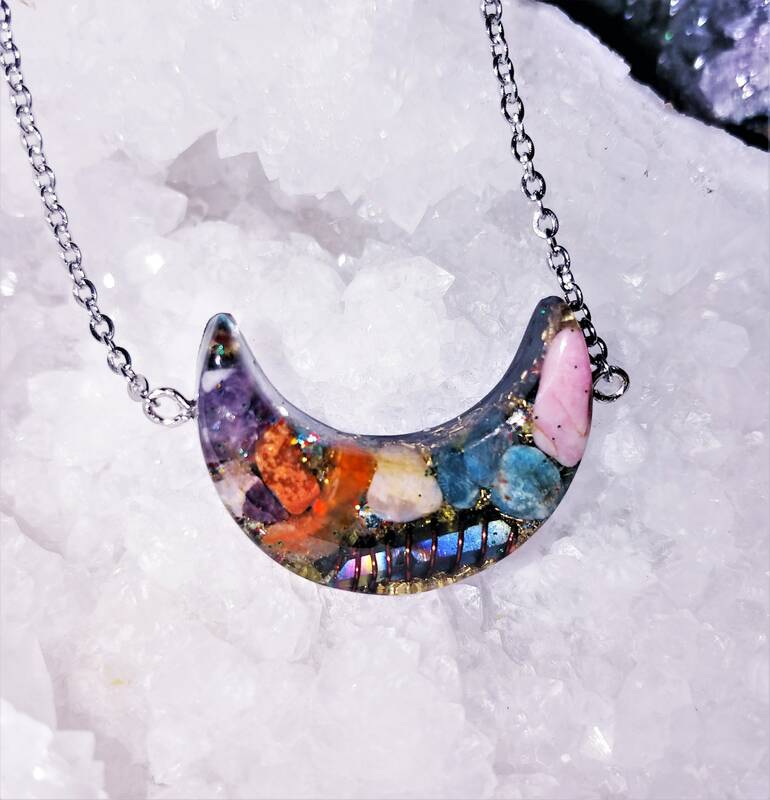 This dainty Orgone Necklace was created with the intention to bring peace, love and harmony into your environment. It contains Powerful Rainbow Aura Quartz Crystal in copper wire, Amethyst, Blue Apatite, Moonstone, Pink Opal, Carnelian, Shungite powder, Sage, Rose Petals, Mica Flakes, 24 K gold flakes, Metal shavings (brass), Pyrite, Copper coil, Black Sun Iron Oxide nano powder, jewelry grade epoxy resin. Comes on Sterling Silver Chain 22" necklace with lobster clasp. Hangs near Heart Center. Pink Opal is a stone of love and gentleness. It brings energies of gentle love and kindness to both romantic relationships and relationships of other kinds. As with other opals, it also brings inspiration, imagination and creativity. It can help release inhibitions and brings happy dreams. It also eases the process of change. Physically, pink opal is helpful for eyesight, heart disease and injury, Parkinson's disease, lungs, and spleen. Note that healing crystal meanings are spiritual supports to healing and are not prescriptions or healthcare information. Pink opal is associated primarily with the heart chakra. Moonstone is said in crystal healing to help calm responses and stress, and avoid overreaction. It brings hope, enhances feminine energies, sensitivity, intuition, and psychic abilities. It is also said to bring strong energies of abundance to one's life.Moonstone is a stone of protection, especially during childbirth, pregnancy, and travel at sea. It is a stone of calm and relief from emotional stress. It is also associated with love of all kinds. Physically moonstone is used in crystal healing to aid the pituitary gland and digestive system, obesity, water retention, hormonal problems, menstrual problems. Note that healing crystal meanings are spiritual supports to healing and are not prescriptions or healthcare information. Moonstone is also used as a stand in for pearl, when pearl is not available. Moonstone is associated with the crown and third eye chakras, and sometimes with the heart chakra. Apatite is a stone that mystically can stimulate the thoughts and ideas. It is used, often in conjunction with meditation, to increase intellect, imagination, and intuitive and psychic awareness. It is said to help you maintain focus, learn, concentrate effectively, think clearly, and communicate better. Apatite is a powerful meditation or psychic awareness tool. It can clear the aura, enable spiritual attunement, and bring powerful psychic awareness.Apatite is used very successfully mystically for lucid dreaming, deep meditation, astral travel, past life work, rebirthing, and inner wisdom. It is a stone that promotes psychic communication, clairvoyance, and clairaudience. Apatite can be used to enhance the energies of other crystals and stones. Apatite is used by artists and others who wish to have more creativity in their lives to increase their creativity and imagination. Having apatite near you or wearing it can bring harmony on all levels, and brings inner peace. This occurs because it is aid to help release old feelings that may be hampering you in current life, including ones from past lives. Apatite is primarily related to the throat and third eye chakras. I love this piece! I get compliments and questions from people every time I wear it. It arrived with a lovely letter from Elizaveta with many genuine blessings. I will definitely order another piece from here again. Craftsmanship is superb and the shipping was fast, too.